Mustard is a versatile cruciferous vegetable which belong to the Brassica family just like broccoli and cabbage. Native to the temperate areas of Europe, it was amongst the earliest grown crops in the region. From about thousands of years, mustard plant has been quite popularly cultivated in North Africa, Asia and Europe more like an herb was even popular amongst the ancient Greeks and Romans. It has been esteemed as a multi-specialty crop in North America since decades with the major production happening in California and Montana until 1950 and about a decade later in the Upper Midwest regions. Presently it is grown in over 21 countries with major production happening in EU-27, Nepal, Canada, Ukraine and India. Attributing to its flavor and therapeutic nature, usage of mustard is quite popular all around the globe with approx. 700 lbs getting consumed annually. It is a multitalented botanical with many different varieties. Three variants out of these varieties namely white mustard (Brassica alba,) black mustard (Brassica nigra), and brown mustard (Brassica juncea) have gained more popularity over the others and are commercially grown and used for their young flower stalks, leaves and seeds. White mustard or sometimes referred as yellow mustard has a milder taste and is normally used in the preparation of the famous American yellow mustard condiment. 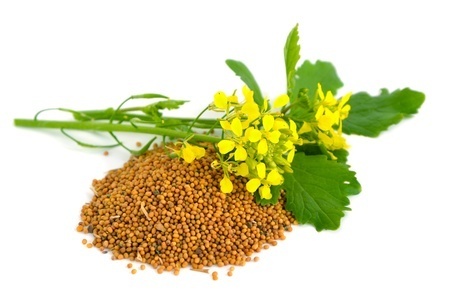 Black mustard is popular for its strong aroma and flavor while, brown mustard which is also used to prepare Dijon mustard offers a sharp pungent taste. Health benefits of mustard include relief from muscular pains, psoriasis, ringworm, contact dermatitis and respiratory disorders. Since earlier times, different parts of mustard plant have been proven beneficial in cancer, diabetes, and detoxification of the body. It has poison repelling qualities, exerts therapeutic effects on the nerves and helps maintain cardiac health. It promotes healthy skin and hair, lowers cholesterol and is a wonderful botanical for women during menopause.